CARE TIPS FOR BRIDAL RHINESTONE JEWELRY! Since most BRIDAL WEDDING JEWELRY is rhinestone jewelry, I would like to devote a page about rhinestones and how to take care of rhinestone jewelry. Rhinestones are artificial clear or colored stones of high luster made of glass, paste or gem quartz that are intended to simulate diamonds. The best rhinestones are cut from quartz crystal. 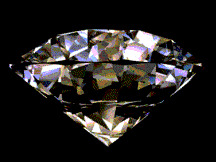 Natural crystals from the bottom of the river Rhine in Germany were early substitutes for diamonds. Hence, the term Rhinestone. Some people also refer to them as crystals or stones. Generally, the stone's cut combined with the overall quality determine the price. The higher the grade, the more the rhinestone will sparkle. Very often you'll see some rhinestones shining different colors. They are called Aurora Borealis (abbreviated AB) rhinestones. Aurora Borealis rhinestones are rhinestones that have a special coating (developed in 1955) which produces a rainbow of colors. It is applied to the surface of a glass stone or bead to create a rainbow-colored sparkle. The term Aurora Borealis is derived from the brilliant colors of yellow, orange, green and blue of the Aurora Borealis, the Northern Lights atmospheric phenomena. Dust is abrasive to rhinestone jewelry and weather elements cause deterioration. Put your bridal rhinestone jewelry in a soft zipped-up pouch so that the dust won't easily get to it and store it in a dry, cool and dust-free environment. Use a glass cleaning agent. Mild soapy water is also okay. However, please remember do not spray the cleaning agent directly to your bridal rhinestone jewelry or submerge the piece into soapy water or a running faucet. Rhinestone jewelry with foil backing should never be submerged into water. Spray a little of the cleaning agent onto a soft clean cloth. Make sure that it is not too wet, just barely enough to get the dust off the piece. For the hard to get to places, use a soft tooth brush or Q-tip with tiny little bit of cleaning agent. Squeeze the excess wetness off the Q-tip or soft toothbrush so that it is barely damp. Make sure that you are gentle when cleaning your bridal rhinestone jewelry. If you use a toothbrush, make sure that it is soft and not scratchy. Be particularly careful with Aurora Borealis stones as they can be scratched easily. After you clean your bridal rhinestone jewelry, leave them out for at least an hour. Make sure that they are completely dry before you put them away. This is very important because moisture causes deterioration to your jewels. I would also recommend cleaning your bridal rhinestone jewelry with a jewelry polishing cloth. It is inexpensive, only a few dollars a piece. If the cloth is getting dirty, please do not re-use it, it is time to get a new one. Otherwise, you'll just be applying dirt to the jewels. You can purchase jewelry polishing cloths at jewelry stores or through the internet. During the course of time if a rhinestone or two fall off, it is a small repair job and you can easily glue it back yourself without hiring a professional. However, you should know how to do it correctly so that the stone will stay glued and won't turn yellow. Get a type of glue that is for rhinestone jewelry and is in a tube with a needle-nose applicator for precision work. Work on a flat surface free of clutter and where there is sufficient lighting. First of all, make sure that the cup which holds the stone is clean. If there is old glue in there, carefully scoop the glue residue with a blade or an appropriate tool. If you are replacing a stone, then make sure the replaced stone is the right size by putting the stone into the cup to see if it fits snuggly. It is better to use a pair of tweezers to handle the stone especially if the stone is small. Put a tiny little bit of glue into the cup, remember not too much, otherwise the glue will fill up to the rim. Any excess glue should be removed before the stone is put in. Let the glue set briefly before you put the stone in. If you put the stone in right away, it will distort the color. Your BRIDAL WEDDING JEWELRY is as precious and beautiful to you as your wedding day, and the sentimental value of it is immeasurable. In taking good care of your BRIDAL WEDDING JEWELRY, you are preserving a sacred memory which you'll forever treasure.